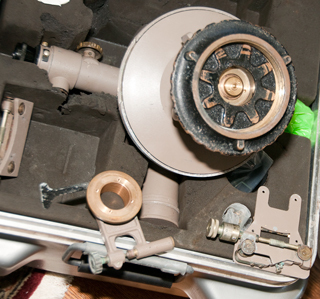 This instrument was made by Warren-Knight and they are still in business (web page). Most of the pibal theodolites have electronic readouts, but they still make this 8403 model as well as another all mechanical model 8500. 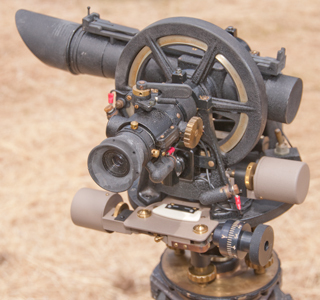 This theodolite is designed to track a ceiling (pilot) balloon, it's also called a PiBal (Pilot Balloon) theodolite or a Radiosonde. 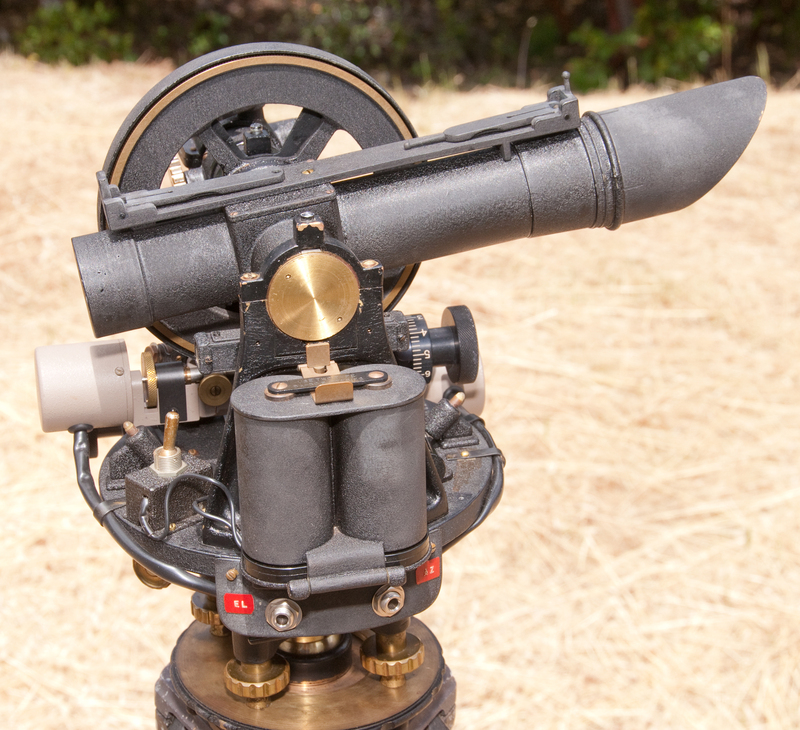 Since the balloon is usually at a high viewing angle the optical design has a right angle bend so that the observer always looks horizontally into the eyepiece and the elevation of the balloon does not effect the observer. 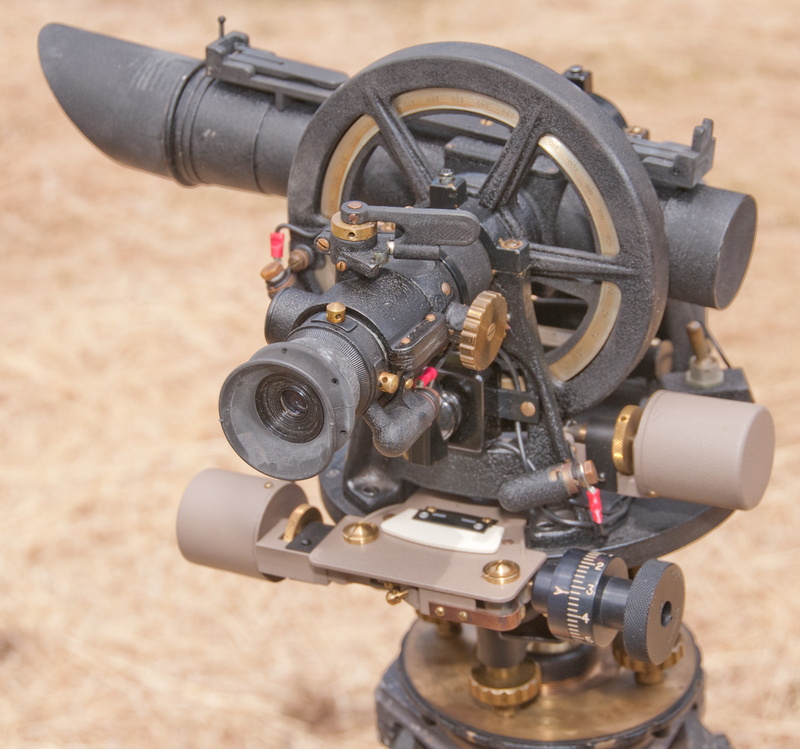 This is very different from a normal theodolite that you can not use at high elevation angles without a 90 degree eyepiece adapter. 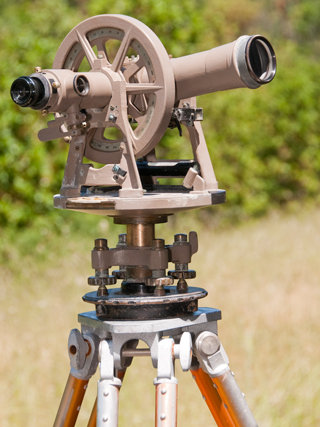 This W-K 20-8403 is a commercial version of the military ML-474 pibal theodolite. They work with the MT-1309 tripod or MT-180 fixed mount. My interest is for looking at stars, and Polaris (Wiki) in particular but also for it's use in relation to weather. There are a number of different things that can be determined using a balloon. The balloons are very standardized in terms of construction and inflation so that their rate of rise will be known. Balloons are also used to raise antennas like for the Gibson Girl lifeboat survival transmitter. This is done using a ceiling balloon (Wiki) and a stop watch. Not sure if just by eye or if binoculars or a telescope is used in addition. Ceiling height is not when the balloon disapears, but rather when it starts to fade. The balloon is tracked and data recorded for time since launch, azimuth relative to true North and elevation angle. For daytime observations it's just the balloon that goes up, nothing is attached to it. In times past a water activated reserve battery was used to light a flashlight bulb so the balloon could be tracked at night. To determine weather parameters aloft a Radiosonde (Wiki) can be lifted by the balloon. It transmits back the pressure, temperature and humidity. The units used in the 1950s used the pressure change to switch between temperature and humidity so that only a single parameter was transmitted and by paying attention to the time and number of cycles the pressure could be determined and the pressure is related to the altitude. Not sure if these were tracked with a pibal theodolite. But later they were tracked by the SCR-568 radar (these used to be advertized in military surplus flyers). Mounts on a standard 3-1/2"-8 surveying tripod. 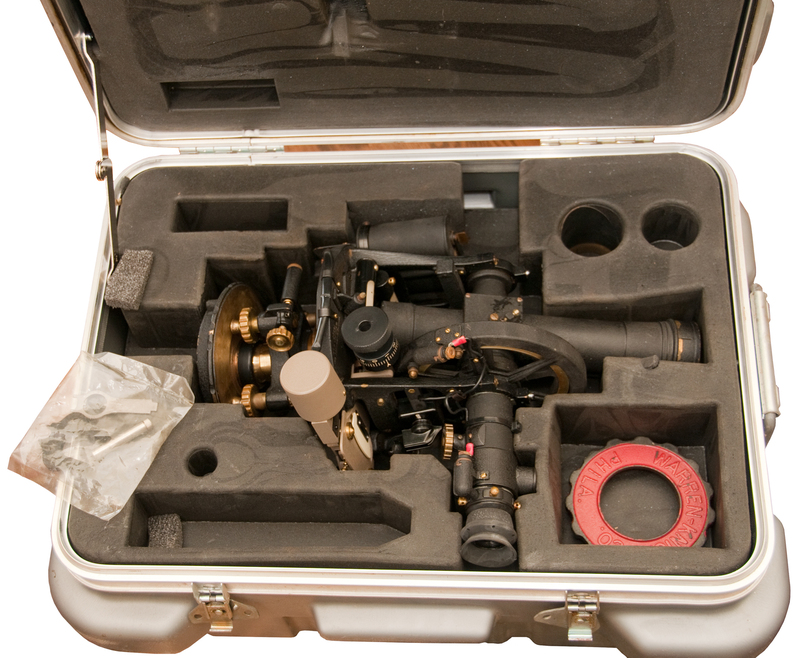 There is a level under the eyepiece that switches the optical path between the finder scope and the main telescope. There is a through compass, i.e. a compass without a scale that's only used to indicate North or South. You can see it in Fig 1 on the right just under the main telescope tube. The 20-8403 is a first generation analog type where the readout is a veneer. Battery holder is a separate item resembling a flashlight. The 20-8353 (W-K web page) has shaft encoders added for azimuth and elevation. Battery holder is on instrument frame and uses side-by-side "D" cells. It's intended to be located near a radio aid to navigation (ILS, MLS, VOR, TACAN, VORTAC) and the encoders are used to modulate a UHF radio transmitter. A matching telemetry receiver is in the test aircraft so that they can easily compare the instrument reading with their actual position from the theodolite. Setup and leveling is the same as for any surveying tripod mounted tranist or theodolite. And like a surveying instrument the elevation angle is relative to a bubble level. But unlike a surveying setup the azimuth scale needs to be referenced to true north. TM 11-6675-200-10 for the military ML-47 lists a number of ways of finding North in order to calibrate the azimuth scale. The ways of orienting the azimuth scale to North are: Compass, Sun, Polaris, Equal star/Sun Angles, Datum Lines or Transference. 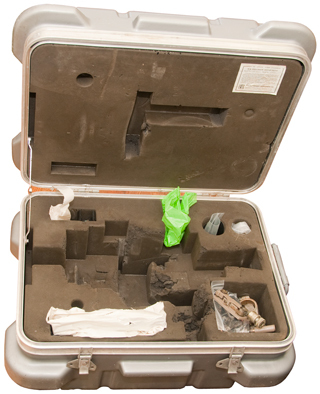 Fig 2 Transit case with factory label. Installing Az cal assy requires special 2-pin spanner. There is a 1/4" phone jack for each encoder. Light colored cylinders are shaft encoders. Fig 23 on factory tripod, legs at minimum length. 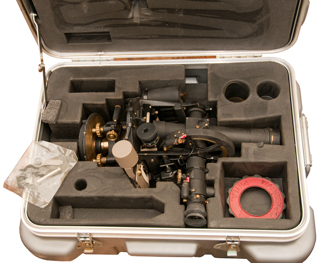 940329 Optical instrument for determining the direction of travel of air-ships and the like, Otto Krell, Nov 16, 1909, 356/150; 33/318; 74/5.3 - gyroscopic stabalized right angle telescope for looking at the ground from the balloon.